In America, today (Thursday) is a day to get together with family and friends and reflect on our blessings – which are many! One of my ancestors, Peregrine White, was the first child born to the Pilgrims in the New World. During November of 1620, Peregrine’s mother Susanna, gave birth to him aboard the ship Mayflower anchored in Provincetown Harbor. His father, William, died that winter – a fate shared by about half of the Pilgrim settlers. The Pilgrims faced death and the uncertainty of a new, little explored land. Why? To establish a place where they could worship freely. With the help of Native Americans that allied with and befriended them, they learned how to survive in this “New World.” Today, we can be thankful for our freedom because of the sacrifices that these pioneers made to worship God in a way that they chose without government control and persecution. 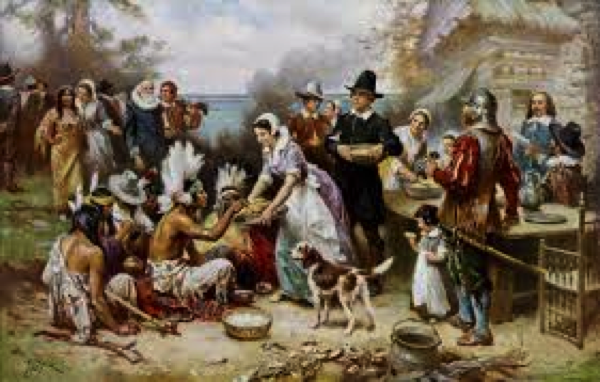 Another interesting history lesson about the Pilgrims was that they initially decided that all food and land should be shared communally. But after the first year, and almost starving to death, they changed their minds. They decided that each family should be given a plot of land and be able to keep the fruits of their labors. Thus those that worked hardest could, in theory, reap the benefits of their extra labor. There would be no forced redistribution of the bounty. The result? A much more bountiful harvest that everyone was thankful for. Thus, private property and keeping the fruits of one’s labor lead to increased productivity, a more bountiful harvest, and prosperity. Is this the root cause of Thanksgiving? William Bradford, Of Plymouth Plantation 1620-1647, ed. Samuel Eliot Morison (New York : Knopf, 1991), p. 120.